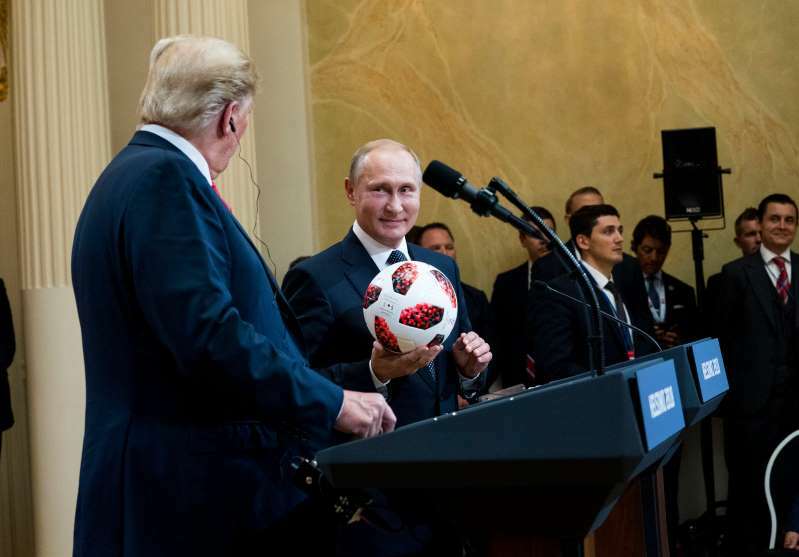 President Vladimir V. Putin of Russia giving a soccer ball to President Trump at a joint news conference in Helsinki, Finland, on Monday. In any other diplomatic setting, it would have been a funny, even insignificant gesture: One president handed a soccer ball, a symbol of teamwork and competition used in the most popular sport in the world, to another, just after the World Cup final. [post_ads]But in this case, according to analysts and lawmakers who watched the Monday news conference between President Trump and President Vladimir V. Putin of Russia, the ball was a metaphor for the gamesmanship that Mr. Putin’s many critics say he is well-versed in — and for how he has scored points against an ill-prepared American leader in this high-stakes diplomatic exercise. “The whole press conference was Trump repeatedly scoring own goals with the ball that Putin had given him,” Brian Taylor, the author of the book “The Code of Putinism” and a political-science professor at Syracuse University, said in an interview, describing a move in which a soccer player scores against his own team. Putin must’ve been extremely happy,” Mr. Taylor added. The ball was just one of many dramatic moments during the joint news conference in Helsinki, Finland, in which Mr. Putin and Mr. Trump seemed to team up against the American press, Democrats and the intelligence community. And it was not the first time an attention-grabbing gimmick has been used between the Russians and the Americans in efforts to smooth over icy diplomatic relations. This time, following years of increasingly hostile actions carried out by Russia against Ukraine, Syria, Britain and the United States, the Russians brought the gimmick. Ball in hand, Mr. Trump smiled, rolled the ball around in his hands, and held it up for the room to see. “That will go to my son Barron,” Mr. Trump said. “In fact, Melania here you go,” the president said, before throwing the ball toward the first lady, who sat next to a grinning Mike Pompeo, the secretary of state. Mr. Taylor noted that Mr. Putin also used the gift of the ball to subtly undermine and invert messages sent by the president’s top aides before the meeting. Just hours before the news conference, Mr. Pompeo said on Twitter that “the ball is in Russia’s court” to work for a better relationship. That phrase has also been used by Jon M. Huntsman Jr., the American ambassador to Russia, in recent weeks. On Monday, Mr. Putin firmly kicked the ball back. Mr. Putin, a former top agent for the K.G.B., came to the news conference steely-eyed and prepared, as evidenced in the targeted grievances he aired against longtime foes. Across from him, Mr. Trump, a leader who dislikes preparing for high-stakes meetings with other leaders and instead relies on personal relationships to guide his diplomatic deal making, seemed to come in focused on flattering Mr. Putin. “That Putin had this gimmick ready and pulled it off well could be a metaphor for the way both of them tend to prepare for these kind of events,” Mr. Taylor said. Whether he realized it or not, it was a Russian journalist from a state-funded news organization who set up the soccer-ball exchange. Mr. Putin called on Ilya Petrenko, a journalist with RT, the broadcaster formerly known as Russia Today, who asked the Russian president about the ball being “in the Russian court” when it comes to cooperation with the United States on Syria. As Mr. Putin answered, he gestured for an aide to brandish the ball. In the hours after the news conference, the White House touted the ball toss from its Twitter account, posting a video clip from Fox News. In an interview with Sean Hannity on Fox News after the meeting with Mr. Putin, Mr. Trump voiced his appreciation for the gift. “That soccer ball was very nice, it really was very nice,” he said. But while the president was in the sky on the way home, it was clear that soccer was the last thing on the minds of those in his party. [post_ads]Paul D. Ryan, the Republican speaker of the house, released a statement saying, “Russia is not an ally,” apparently reversing course from earlier in the week, when he said after Mr. Trump attacked his allies at NATO that the president’s behavior should not be criticized overseas. Senator John McCain, the Arizona Republican, had harsher words. Newt Gingrich, the former House speaker whose wife was nominated by Mr. Trump to serve as an ambassador to the Vatican, also broke rank. He also noticed the soccer ball.